The funny bus in vintage style has 2 games in 1. 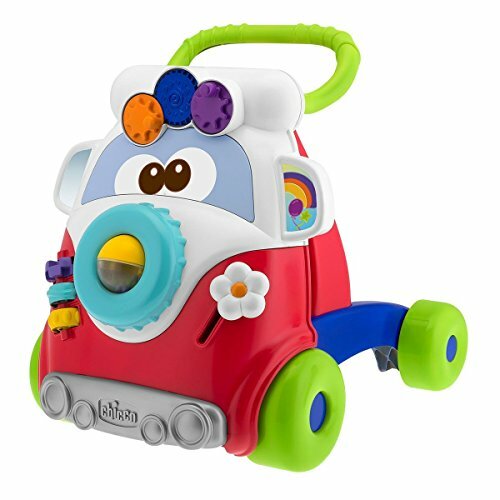 It is a first steps baby walker toy that helps the child to acquire balance and move his first steps safely, thanks to the large four wheels that help stability. It is a rich activity centre that offers 5 different manual activities. 1 height position. Size H42, W40, D40cm. Weight 1.03kg. Suitable for babies up to 15kg. For ages 9 months and over. . WARNING(S): To be used under the direct supervision of an adult. This toy does not provide protection. If you have any questions about this product by Chicco, contact us by completing and submitting the form below. If you are looking for a specif part number, please include it with your message.